NIA CHARLESTOWN NEVIS (JANUARY 16, 2015) — Senior officers of the Customs and Exercise Department on Nevis met with Premier and Minister of Finance Hon. Vance Amory and Permanent Secretary in the Ministry of Finance Colin Dore for a meeting ahead of the budget preparation for 2016. The session was held at the Ministry’s conference room on June 16, 2015. According to Assistant Comptroller Shane Hanley, the meeting was called to provide a forum for the Ministry of Finance to participate more in the department’s planning strategy, to solicit support from the Ministry of Finance for resource requirements, to encourage transparency between both entities and to highlight the department’s deliverables for 2015. He outlined the matters that were discussed, among them the strategic objectives of the Customs and Excise Department, Customs Risk Management Policy, Voluntary Compliance, Risk Management Implementation Plan 2015 and a Divisional Work Plan. Hanley stated that the Customs Department is continually working to address boarder security risks, introduce new enforcement techniques, modernise procedures and processes and meet client expectations for trade facilitation and traveller processing. 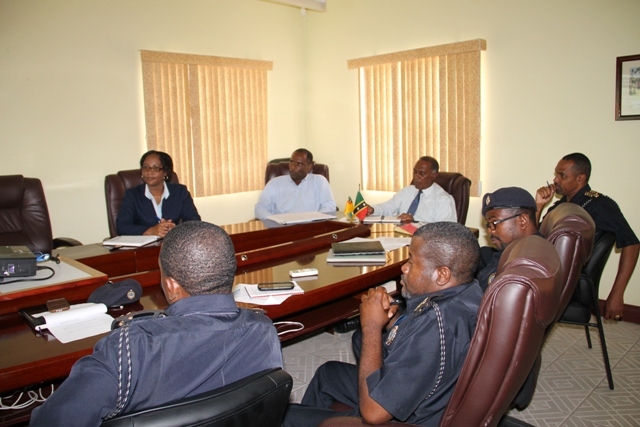 The department’s major goals include maximising revenue collection, enhancing trade facilitation, enforcement and boarder protection capabilities in order to safeguard the society, strengthen organisational capacity and enhance human resource policies and practices and the harmonisation of St. Kitts and Nevis Customs and Exercise Department’s organisation policies, procedures, systems and capacities. 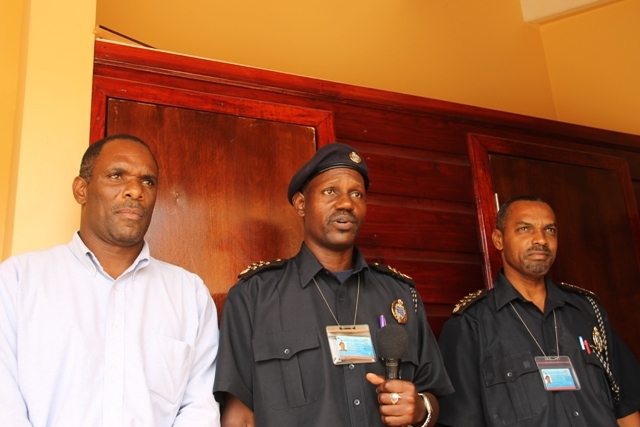 In comments following the meeting, Deputy Comptroller of Customs on Nevis Cynric Carey described the meeting as fruitful. He said the responses from both Mr. Amory and Mr. Dore were positive and he expressed confidence that moving forward the department’s Development Plan 2015 would be successful and it would have the full support of the Nevis Island Administration. Mr. Dore, in brief comments, said the development plan presented by the department was an impressive one. The Ministry of Finance supports it fully and the Premier’s presence was indicative of that. He said they would move forward in unison to seek to promote the department and take it to a level of satisfactory performance based on what was required by their mandate. The Permanent Secretary said the Ministry was aware that the environment in which the department operates had evolved over the past five to 10 years and had become more challenging. “Based on the plan they have outlined today, there are some measures in it which can be done short term, some in the medium term and some more long term ranging from physical space to equipment, security protection and so on. “We have taken all of those things on board and we will come back for a follow-up meeting later when we start ironing out those things that can be done in 2016,” Dore said. Also present at the meeting were Assistant Comptrollers Lescott Webbe, Warren Pemberton and Roger Fyfield, Principal Assistant Secretary in the Ministry of Finance Joan Browne and Senior Economist in the Ministry of Finance Marlene Jeffers.